The Eastman AR810CE is a one of a now fairly rare breed – a hand carved, full sized arched top and back guitar at a reasonable price. 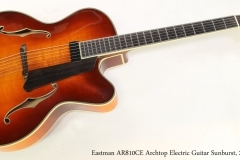 Built to meet the needs of jazz guitarists, this model delivers vintage archtop performance in a modern package. Using a 17 inch wide, 3 1/8 inch deep body, the Eastman AR810CE has a hand carved solid Spruce top and carved figured Maple back. The neck is Maple with a bound Ebony fingerboard, and Ebony is also used for the head plate, pickguard, bridge and tailpiece. An Eastman mini-humbucker is suspension mounted at the neck, not contacting the body. 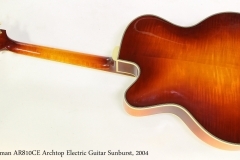 The finish is nitrocellulose lacquer, in a vintage sunburst. The body, neck headstock and F-holes are all bound. This example dates to 2004 and is in very nice condition, and plays well. There are a few small pressure marks on the back, but they haven’t broken the finish. As the guitar is aging – it’s presently nearly 15 years old – the finish is naturally sinking into the wood pores, showing the grain. It’s a very nice effect typically only occurring with time. The original, moulded yellow fiberglass hard shell case is included.